Switch up your standard seating arrangement with this upholstered chair-and-a-half. 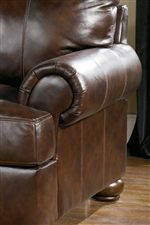 Offering exceptional comfort at every angle, this chair features leather upholstery over 1.8 density foam for the perfect blend of cushion and support. Topped with a decorative throw pillow for added style and support, this chair is the ultimate in function and fashion. 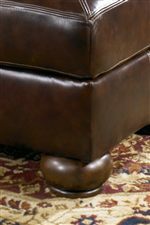 From rolled arms to bun wood feet, this piece exudes a rustic, traditional style that will bring character to any room. Fit snugly in the corner of your den or positioned next to your living room sofa, this chair-and-a-half will make any lounge area complete. The Axiom - Walnut Traditional Upholstered Chair and a Half with Bun Wood Feet by Signature Design by Ashley at Walker's Furniture in the Spokane, Kennewick, Tri-Cities, Wenatchee, Coeur D’Alene, Yakima, Walla Walla, Umatilla, Moses Lake area. Product availability may vary. Contact us for the most current availability on this product. The Axiom - Walnut collection is a great option if you are looking for Traditional furniture in the Spokane, Kennewick, Tri-Cities, Wenatchee, Coeur D’Alene, Yakima, Walla Walla, Umatilla, Moses Lake area. Browse other items in the Axiom - Walnut collection from Walker's Furniture in the Spokane, Kennewick, Tri-Cities, Wenatchee, Coeur D’Alene, Yakima, Walla Walla, Umatilla, Moses Lake area.